Feaghna Bullaun Stone "The Rolls of Butter"
I was really delighted to finally visit the amazing bullaun at Feaghna graveyard. This stone is a huge square-shaped boulder embedded in the ground at one end. 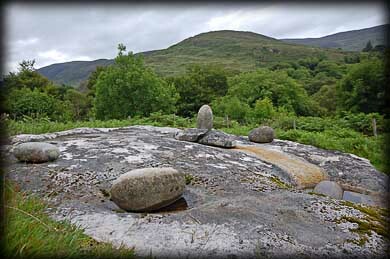 On the top of the stone are eight depressions of various depths, these are known as bullauns. Some of the larger bullauns carry oval stones known as either cursing stones or curing stones. These bullaun stones have come to be associated with Christian sites, but some are much earlier than the christian period, and this is probably one of those earlier stones. It is located in a field adjacent to St Fiachna's cemetery. It has been noted that the boundary wall of the graveyard and the bullaun stone are directly in alignment with the rising sun at the winter solstice. 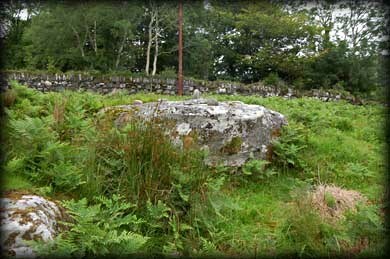 Placed at the centre of the boulder is a round holed stone with a very phallic looking stone standing upright in the hole. According to tradition, a local woman who had stolen milk from a neighbour's cow was using it to make butter, when St Fiachna came upon her. The saint became enraged and petrified her butter rolls, churn top, and dasher, all of which can be viewed at the site today. 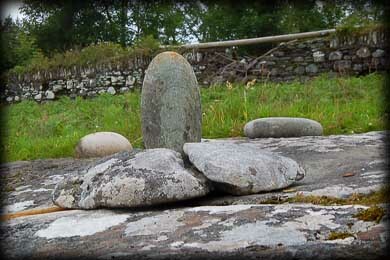 There is another fine example of these turning or cursing stones at Killinagh in County Cavan, known as St Brigid's Stones. Situated: From Bonane Heritage Park. Head southeast, take the first left and then keep left at the next fork. Feaghna cemetery is about 2.8 kilometres from the Park. The boulder is in the field on your left before the cemetery. Ask for permission at the house. Discovery Map 85: V 9663 6402. Last visit July 2011.